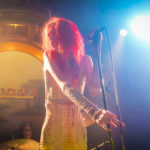 With a sound that is part guitar glam and part punk with a layer of heavy, crunchy fuzz throughout, Los Angeles locals Starcrawler have been getting their fair share of attention lately and are on quite a roll coming off of a Grulke Prize win at South By Southwest and recently releasing their self-titled debut album in January (produced by Ryan Adams and released by Rough Trade). 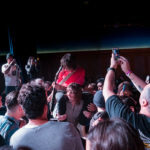 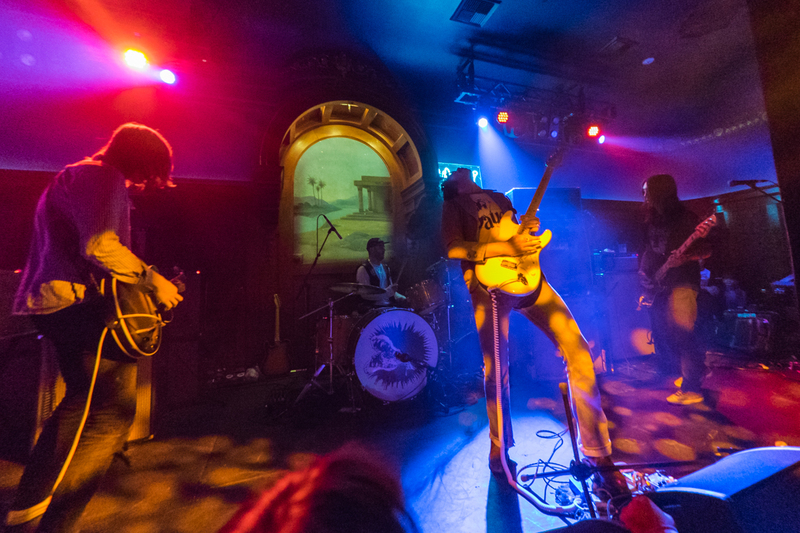 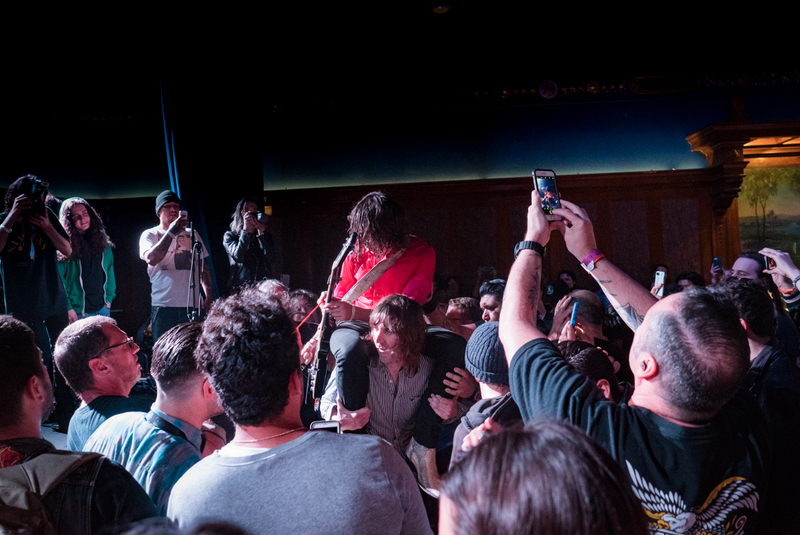 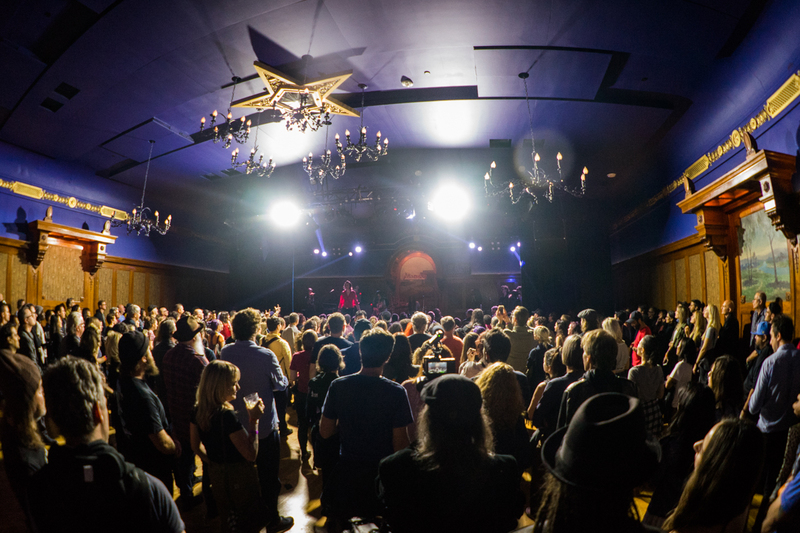 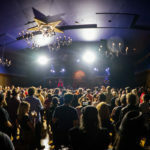 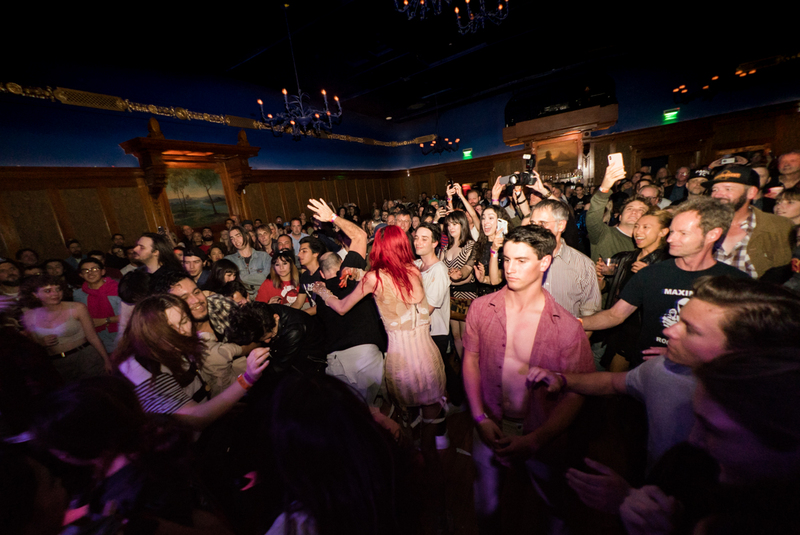 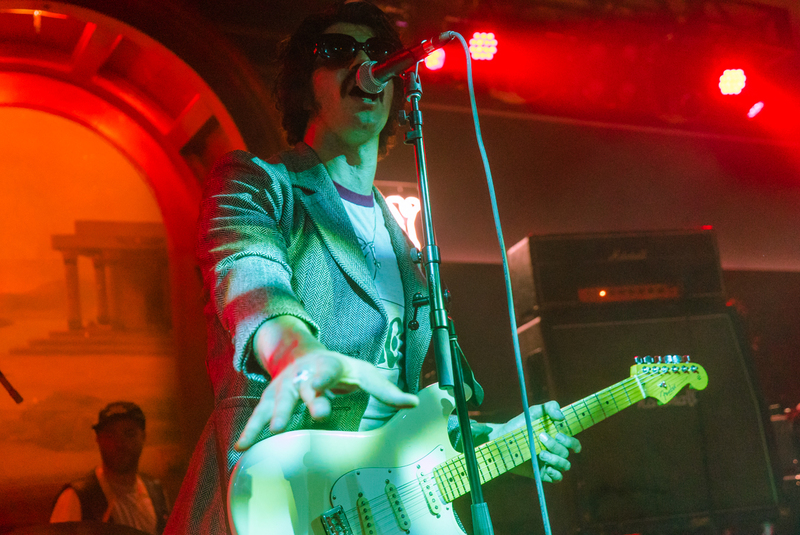 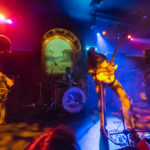 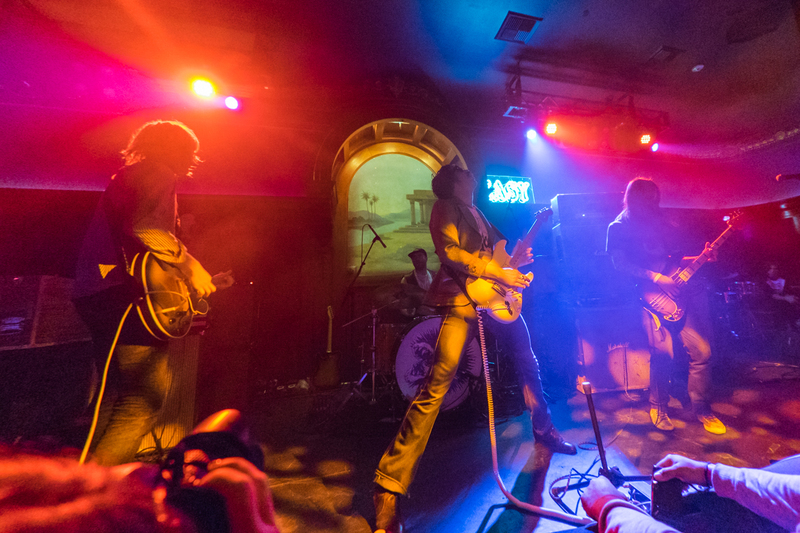 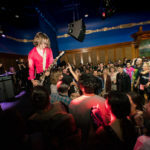 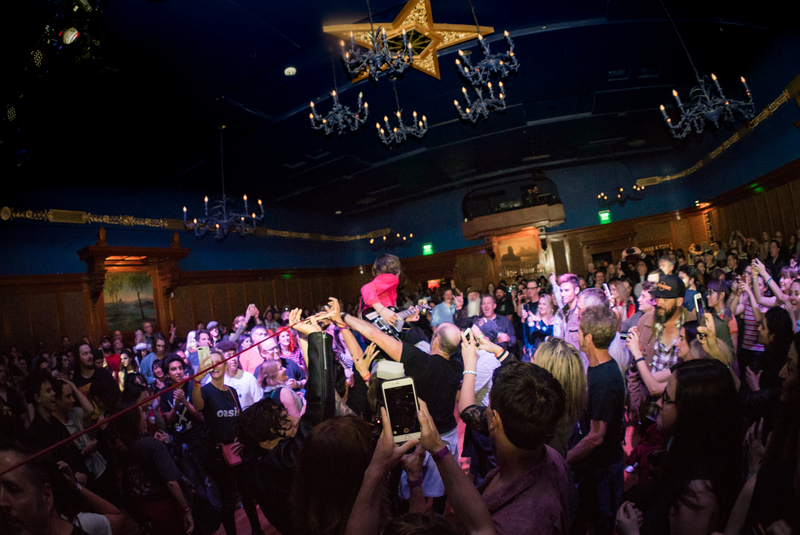 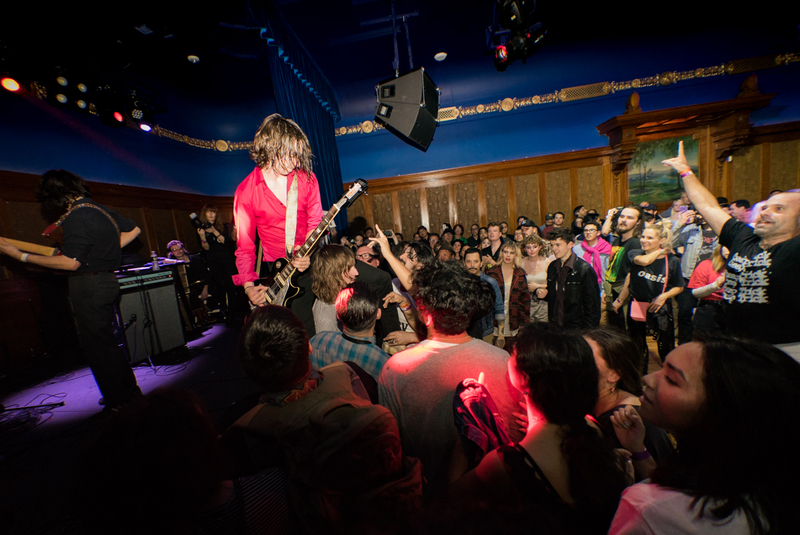 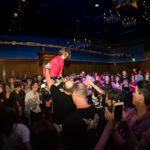 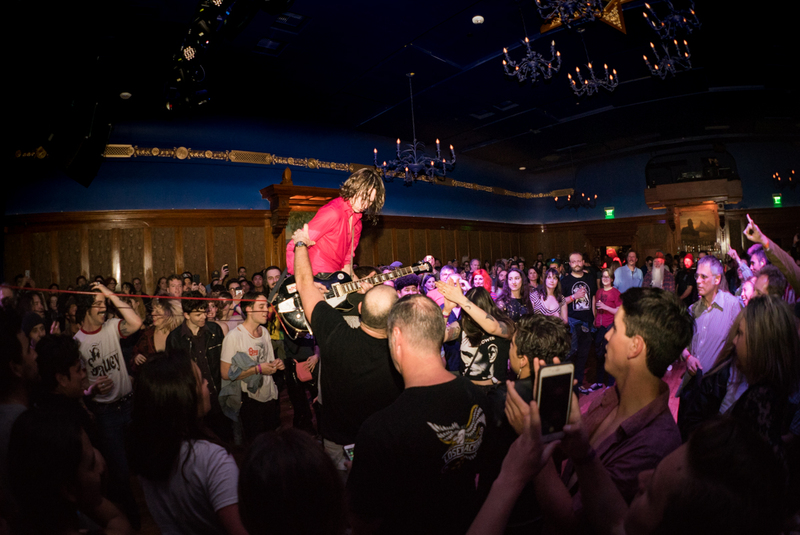 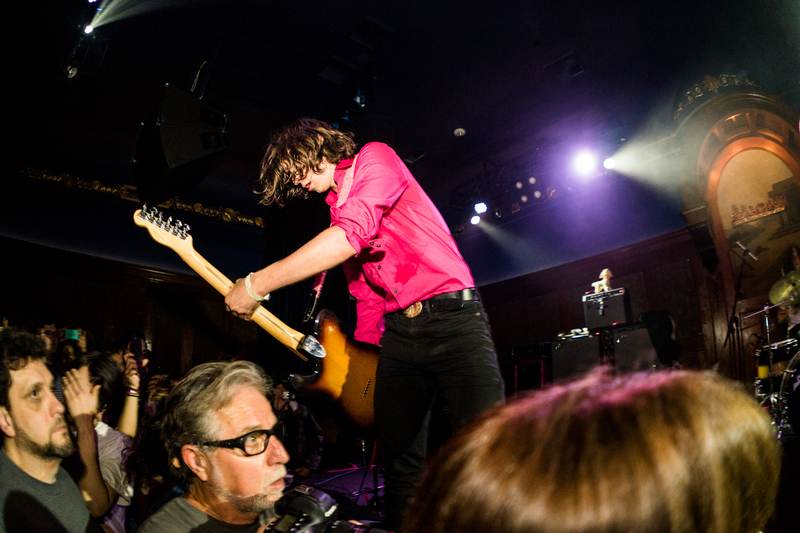 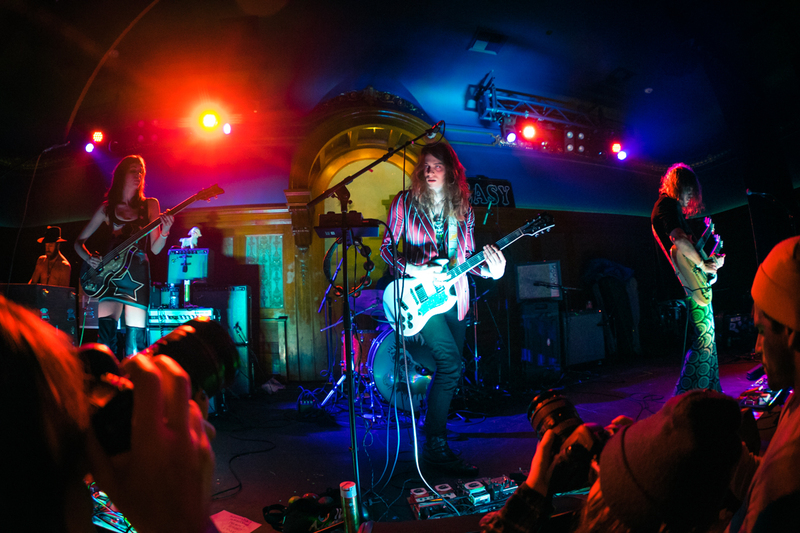 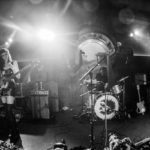 On Saturday they helped break in the recently opened Highland Park venue, the Lodge Room, with a sold-out show. 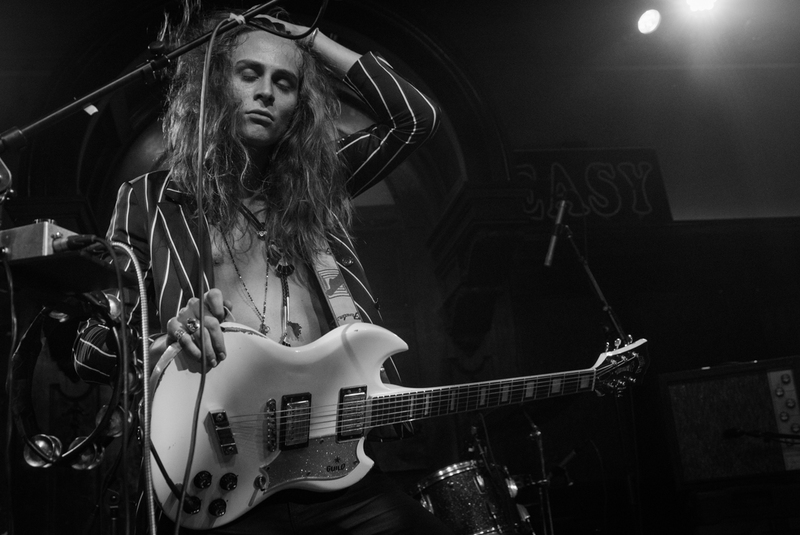 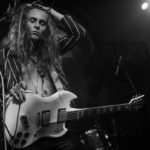 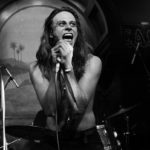 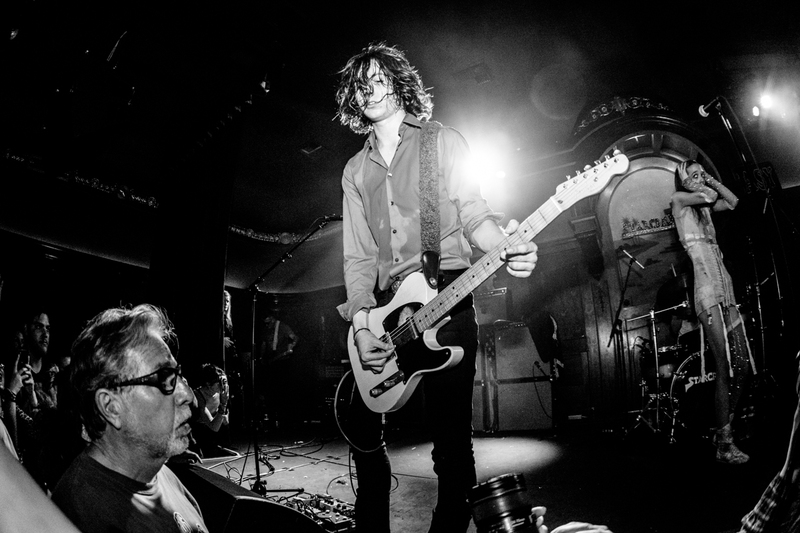 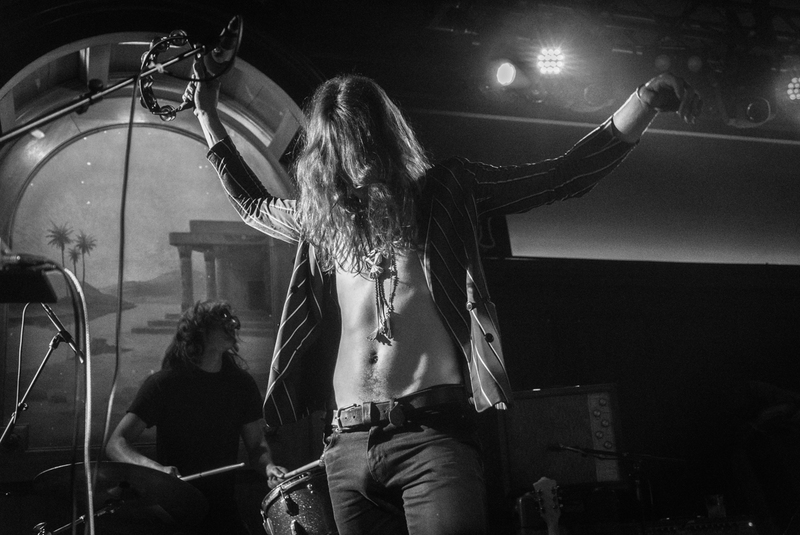 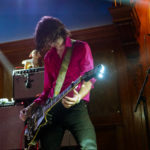 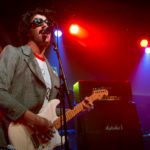 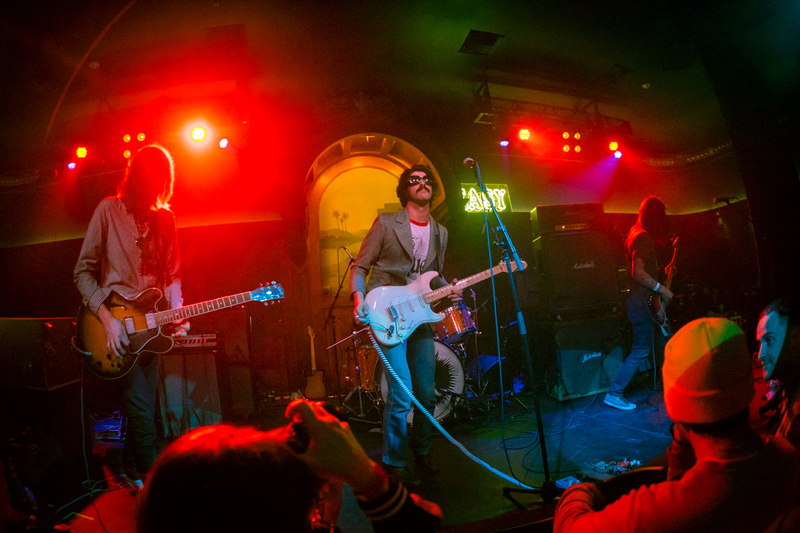 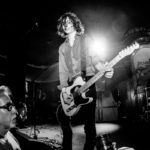 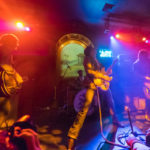 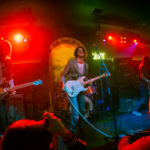 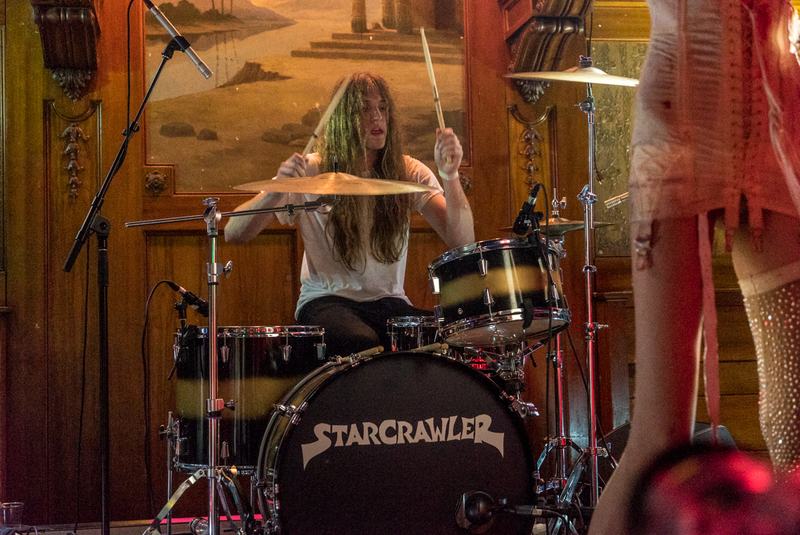 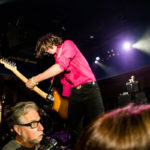 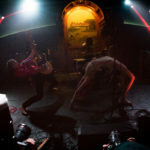 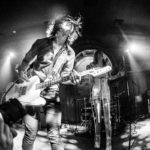 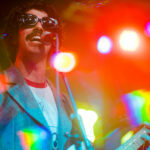 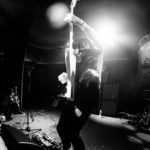 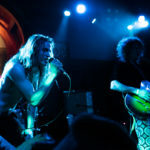 Although the band is a four piece with Austin Smith on drums and Tim Franco on bass, pretty much everyone’s eyes never leave guitarist Henri Cash and lead singer Arrow de Wilde. 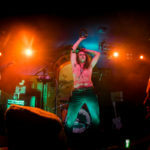 The show opens as a three-piece with Arrow joining the boys by being flung onto the stage and from that point, all hell breaks loose. 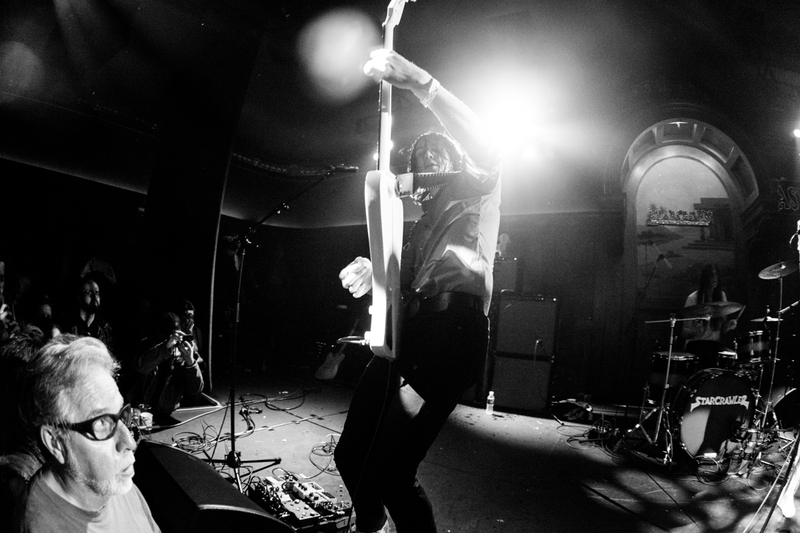 Henri’s guitar skills are well beyond his teenage years and Arrow embodies that insect in the corner of your room that seems catchable and simultaneously not. 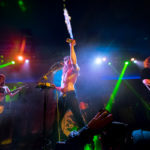 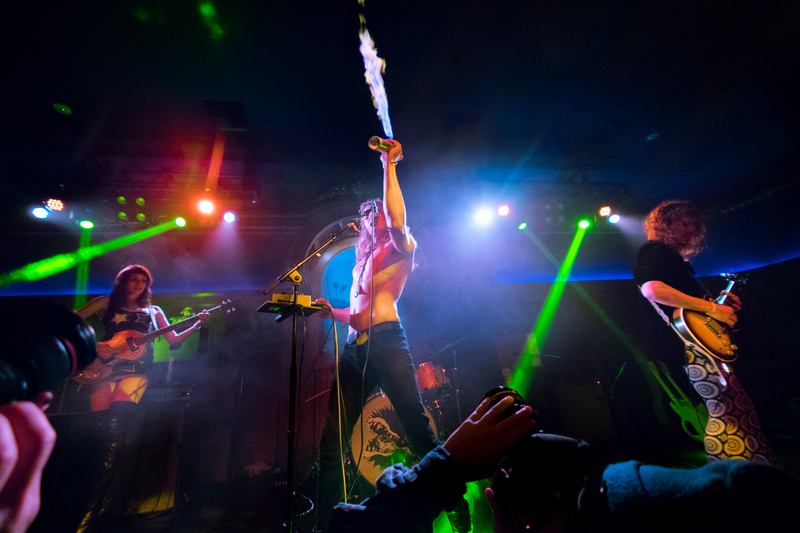 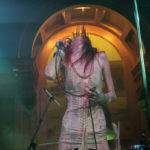 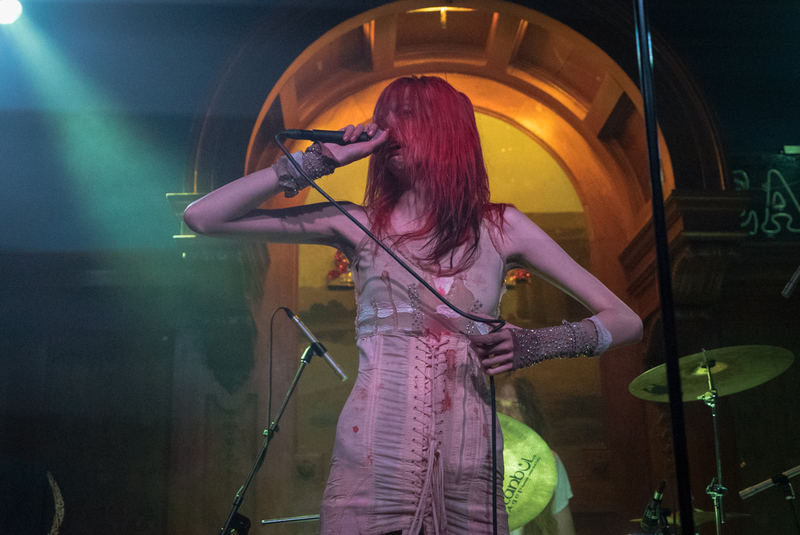 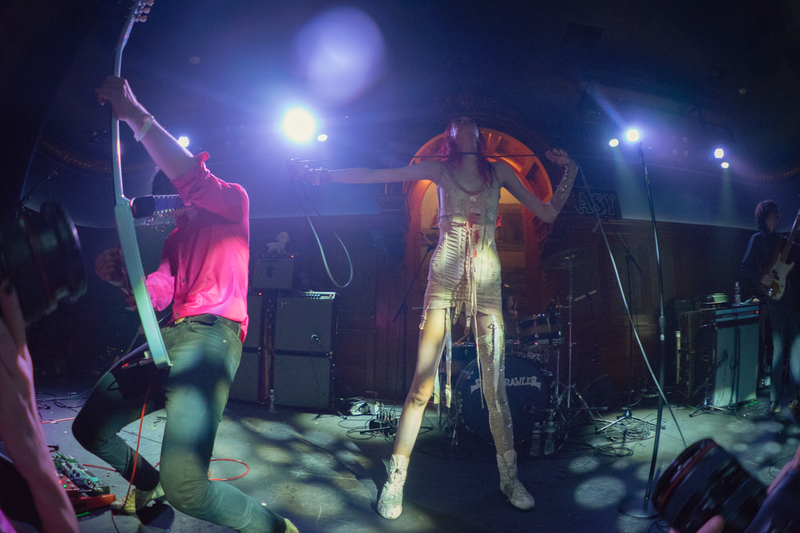 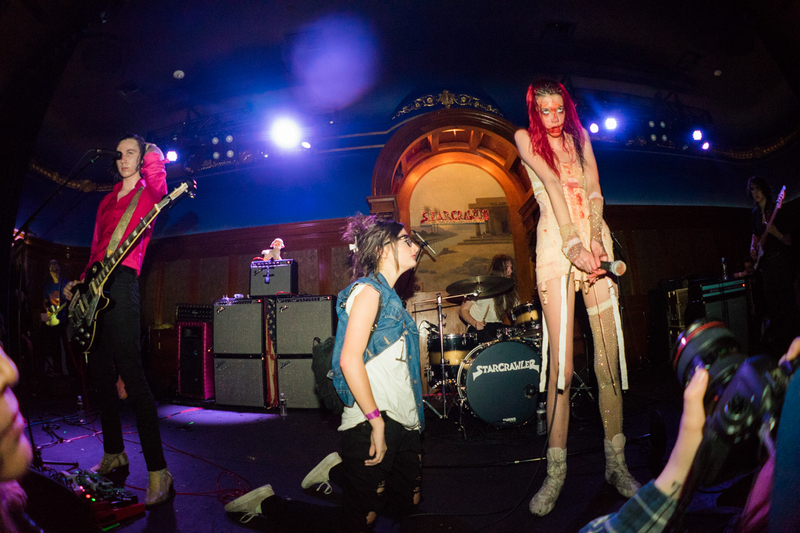 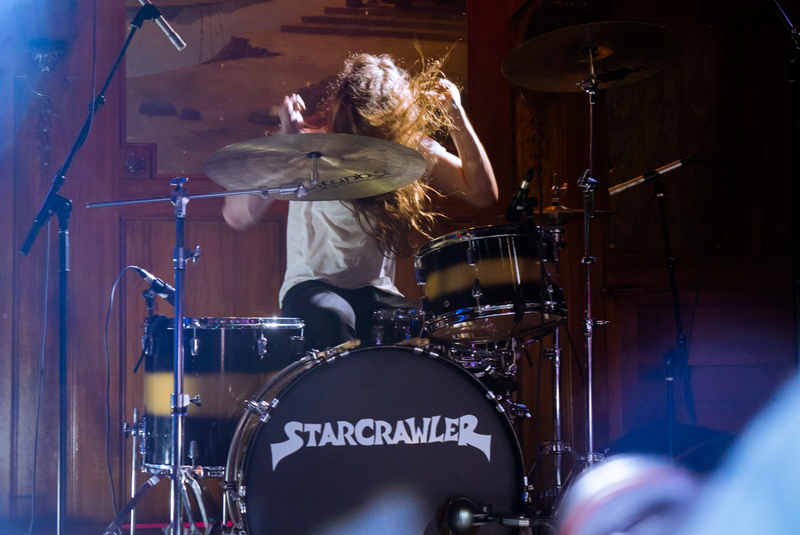 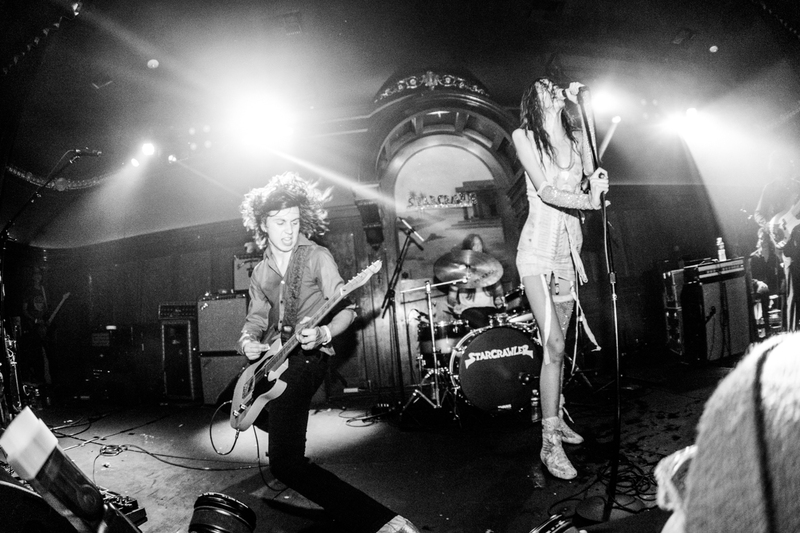 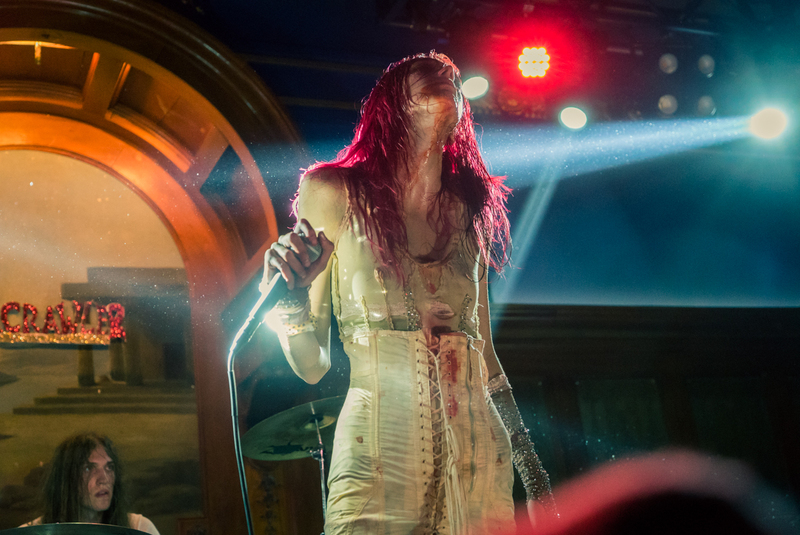 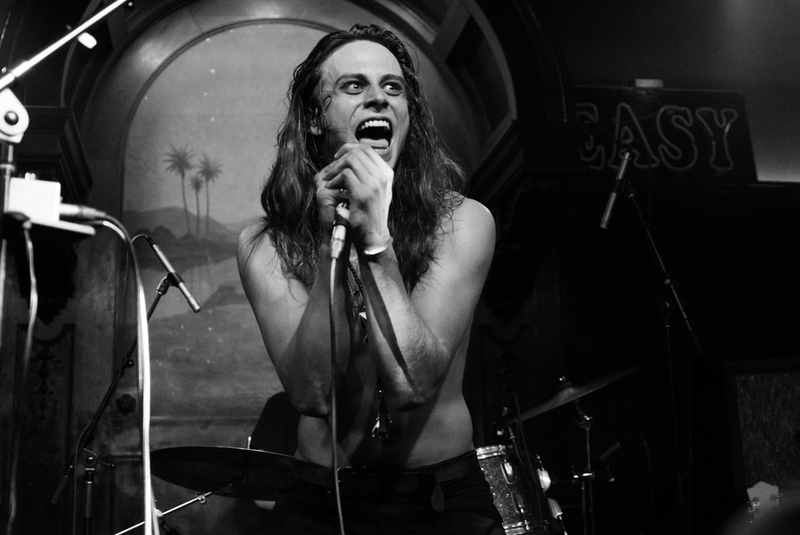 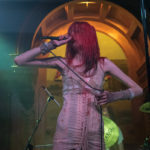 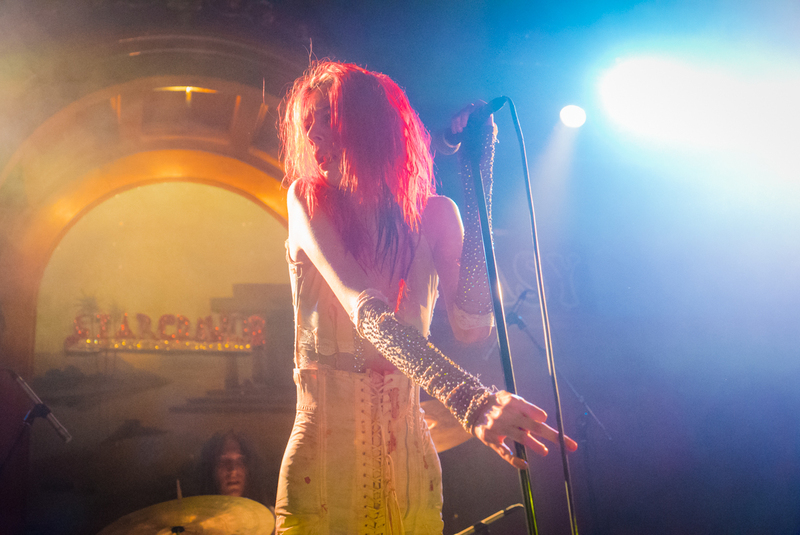 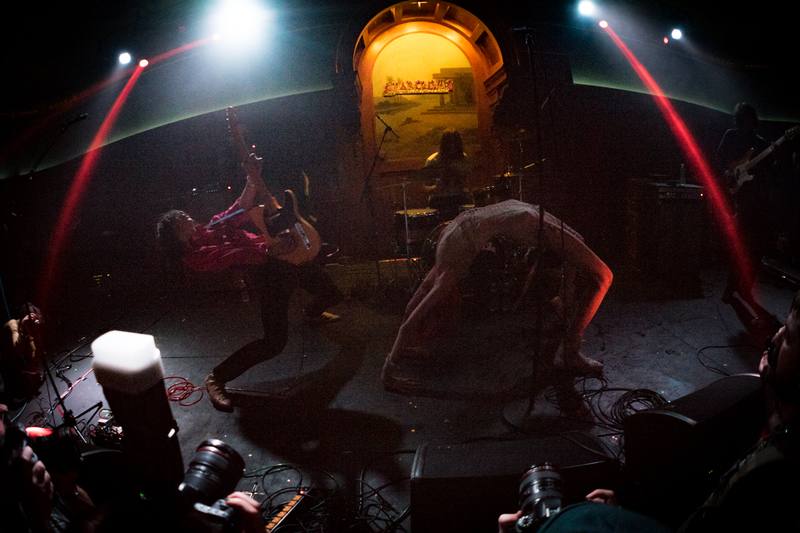 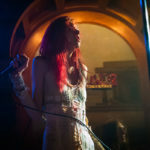 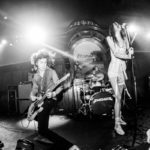 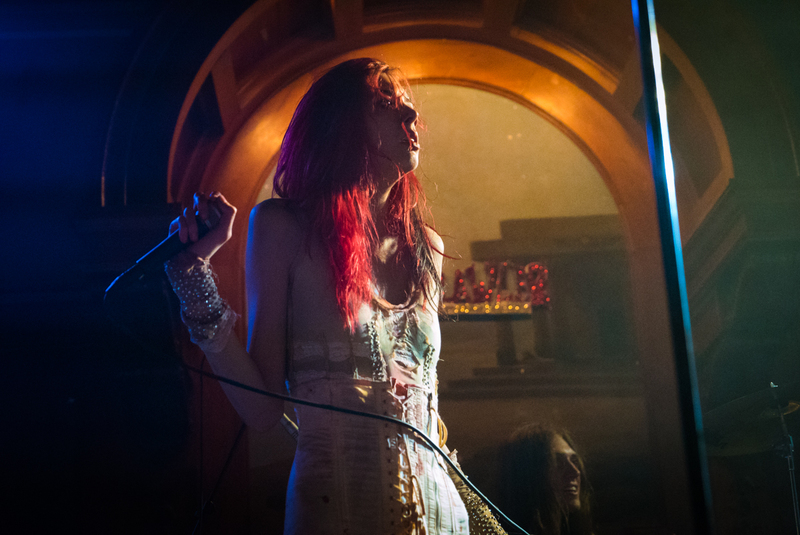 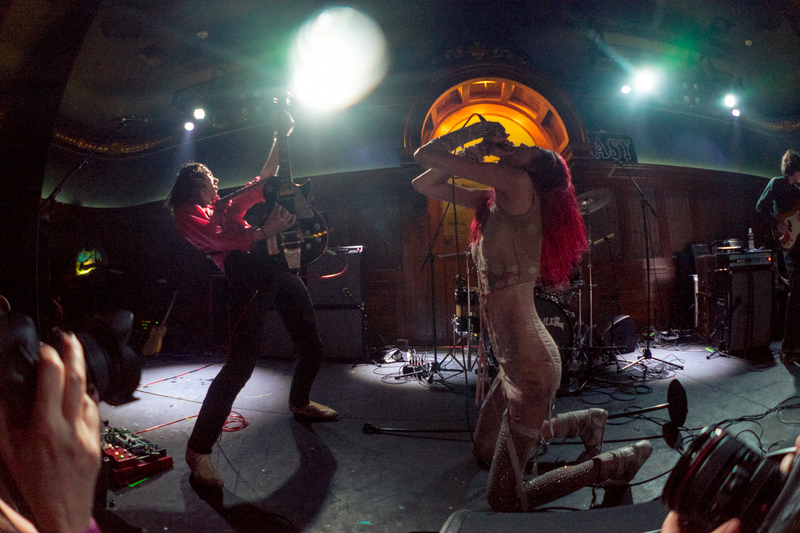 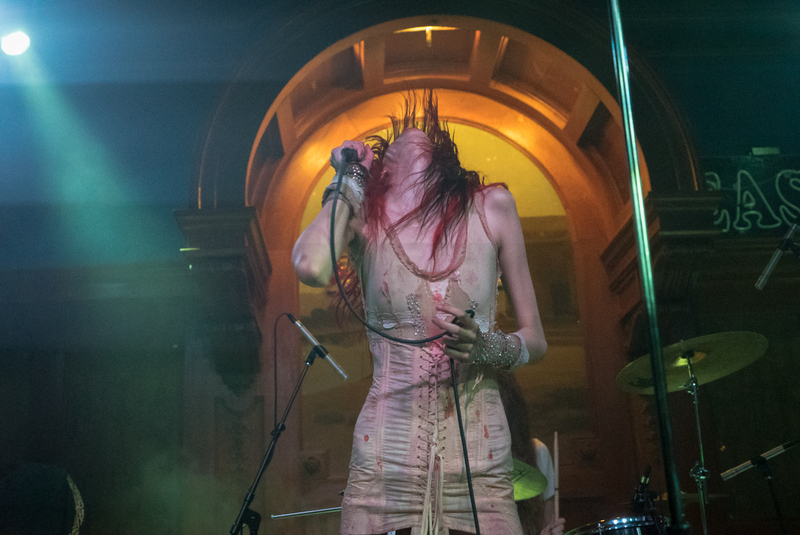 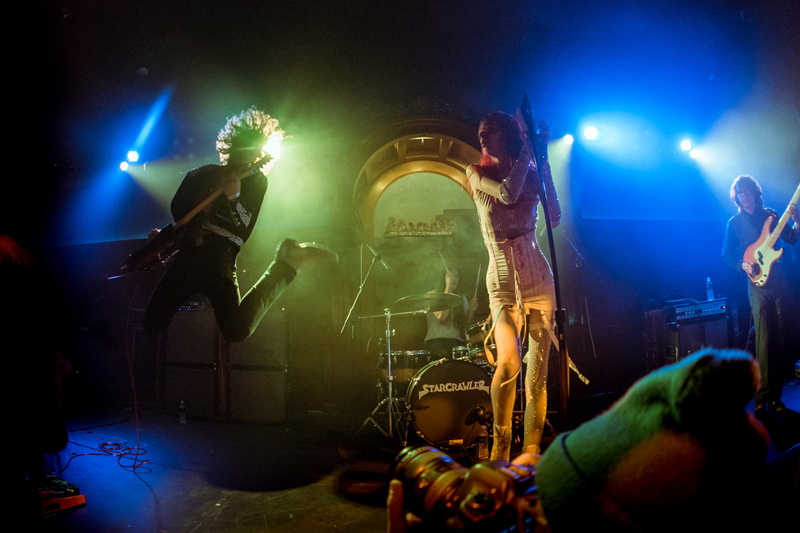 Before Starcrawler was an equally headlining capable band, Uni: a bit of a Glam Frankenstein made of familiar bits. 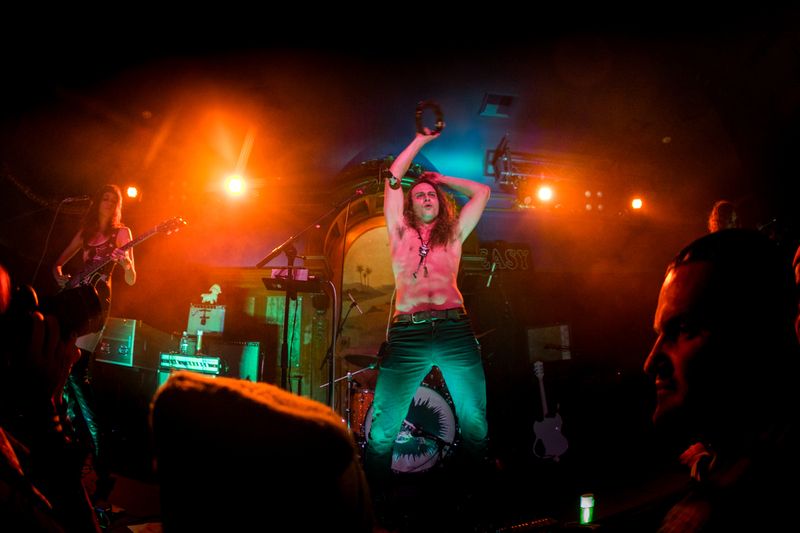 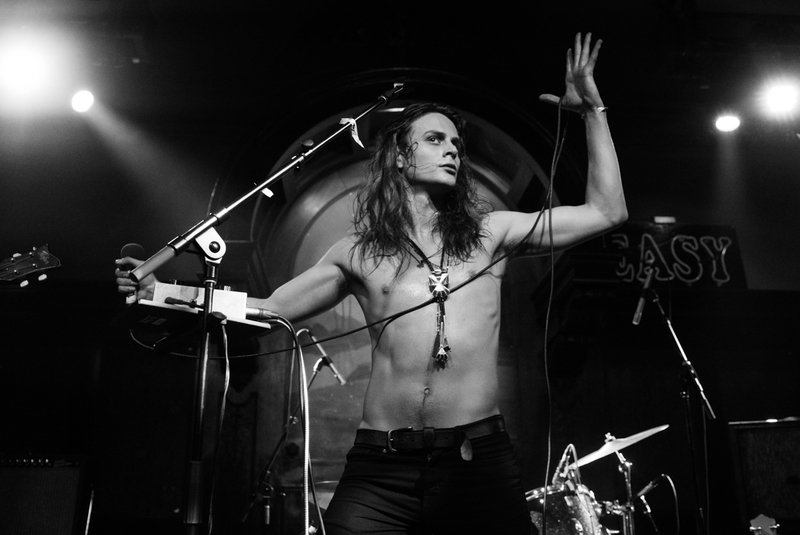 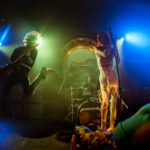 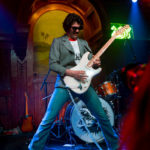 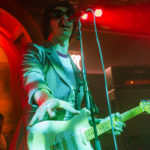 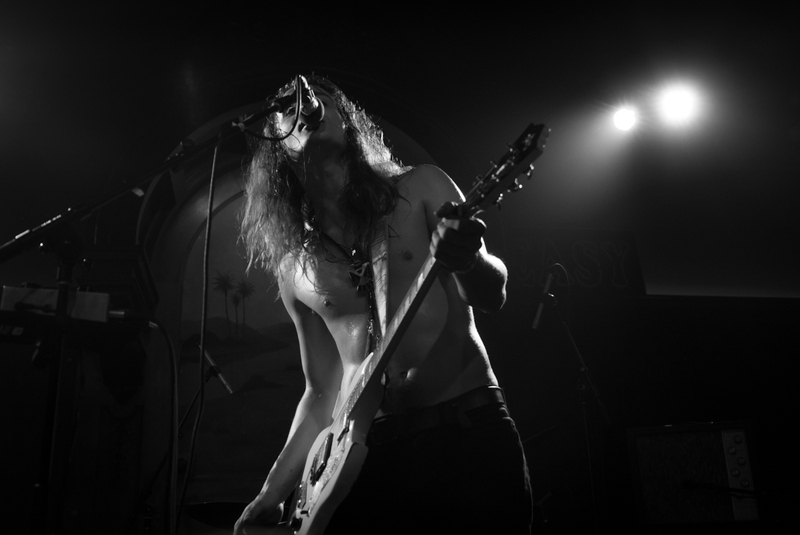 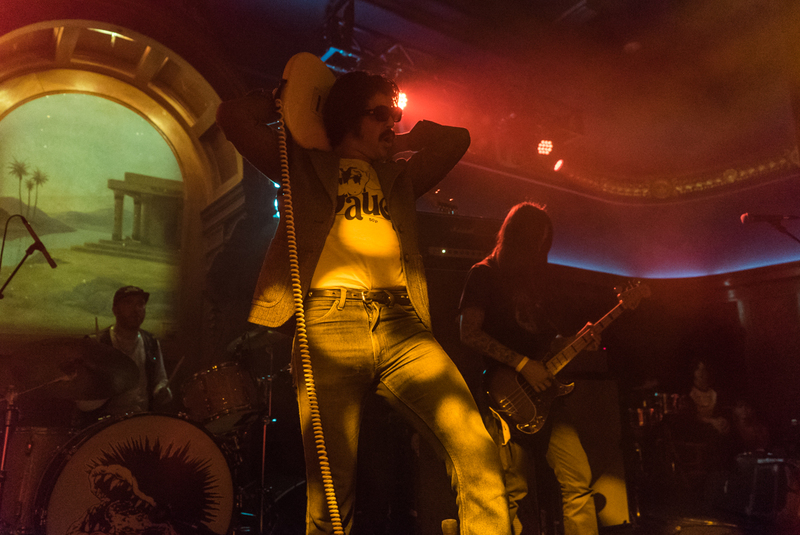 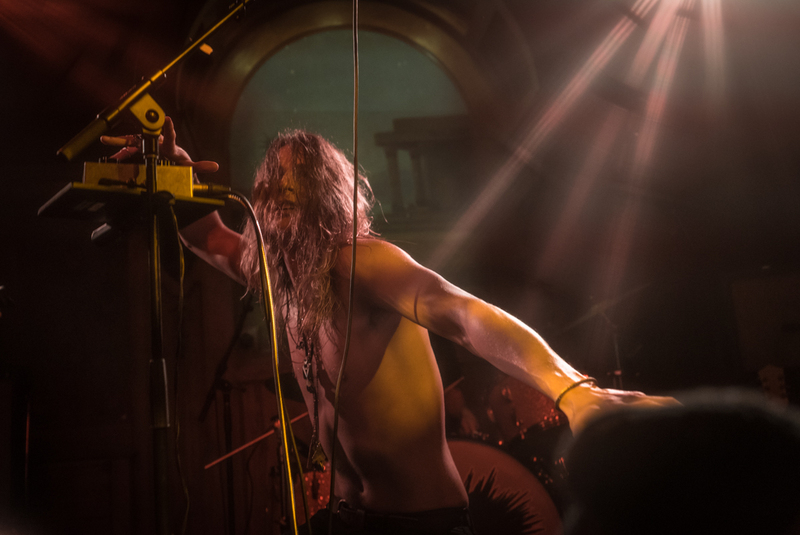 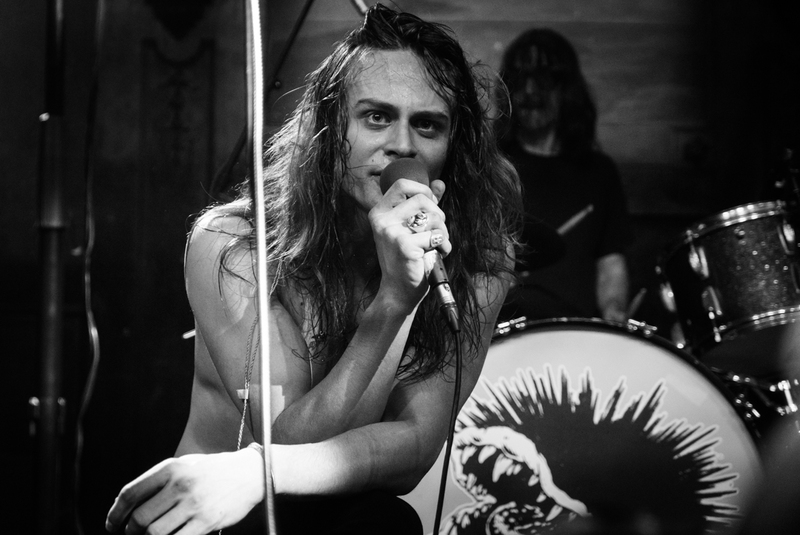 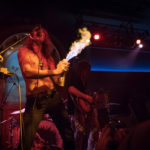 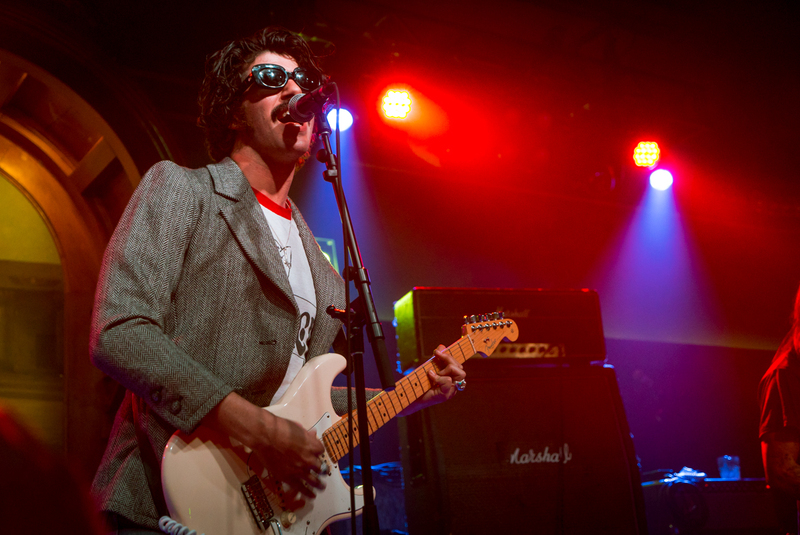 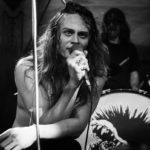 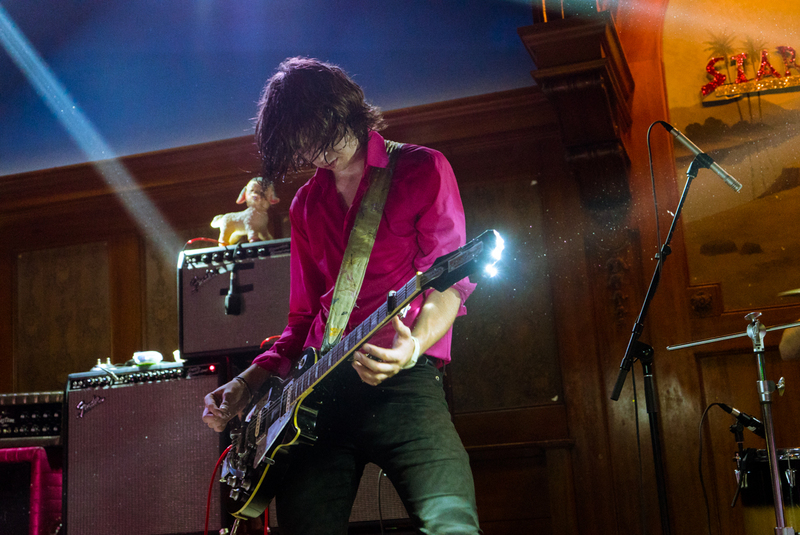 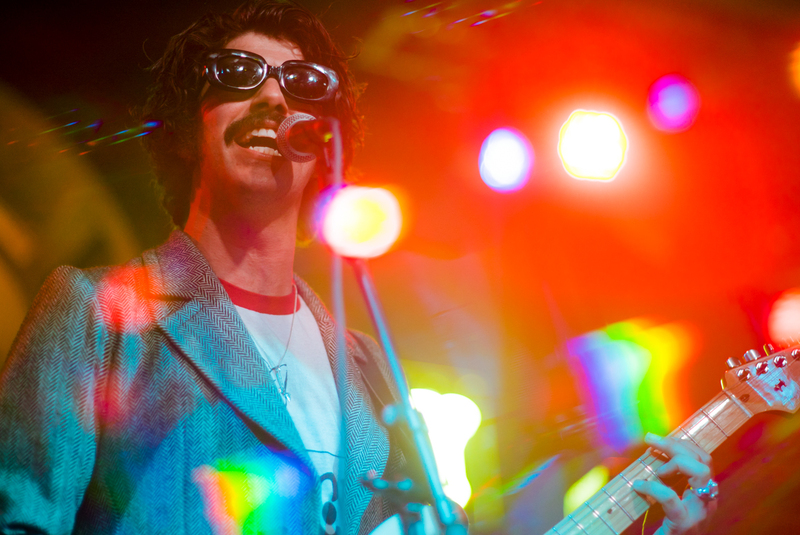 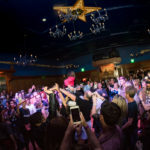 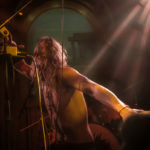 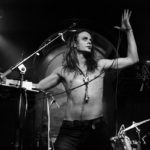 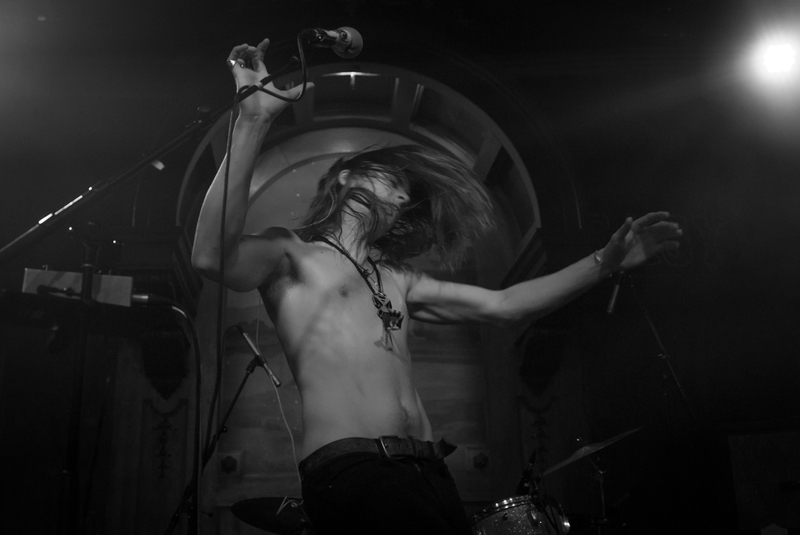 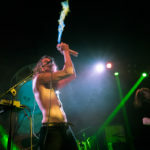 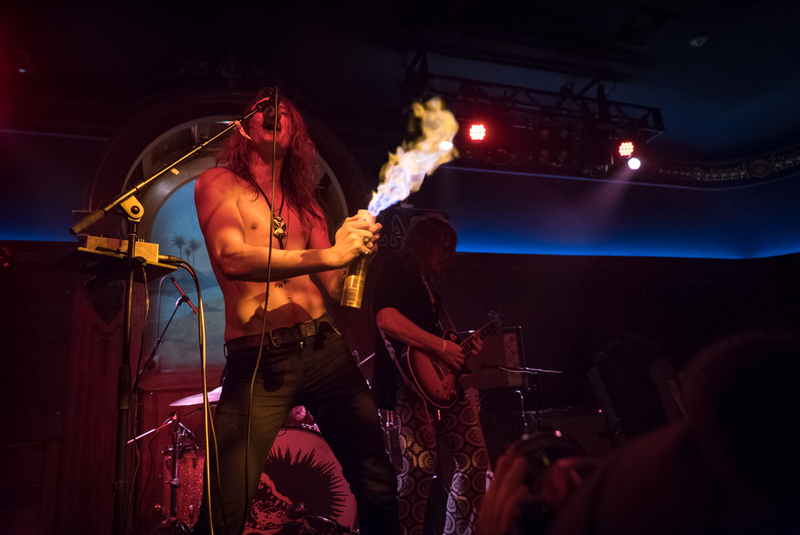 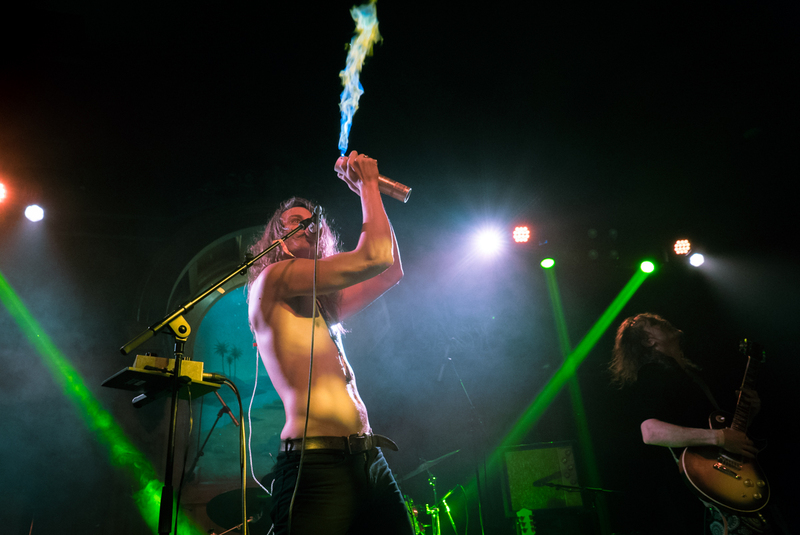 Lead Singer Nico Fuzz unleashed a storm of gold stars and hairspray flamethrowers at the crowd when he wasn’t climbing the walls or disrobing. 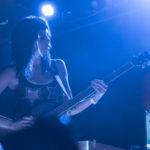 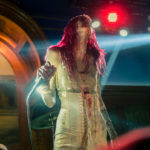 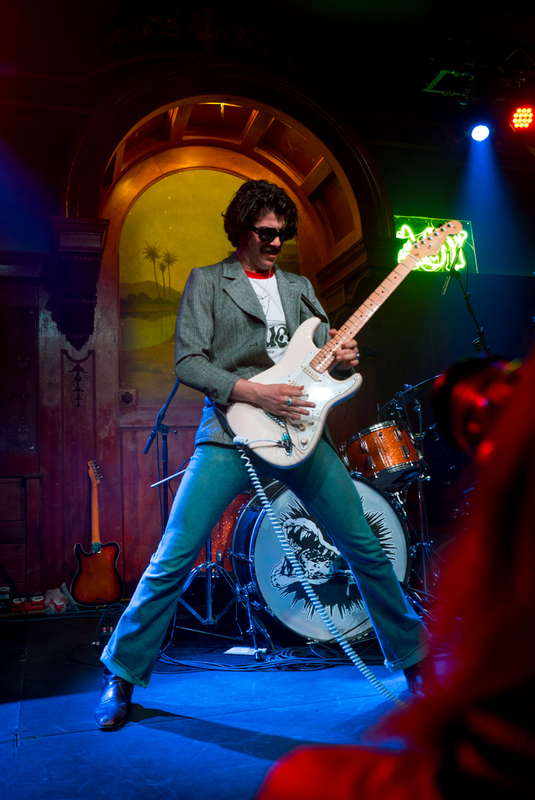 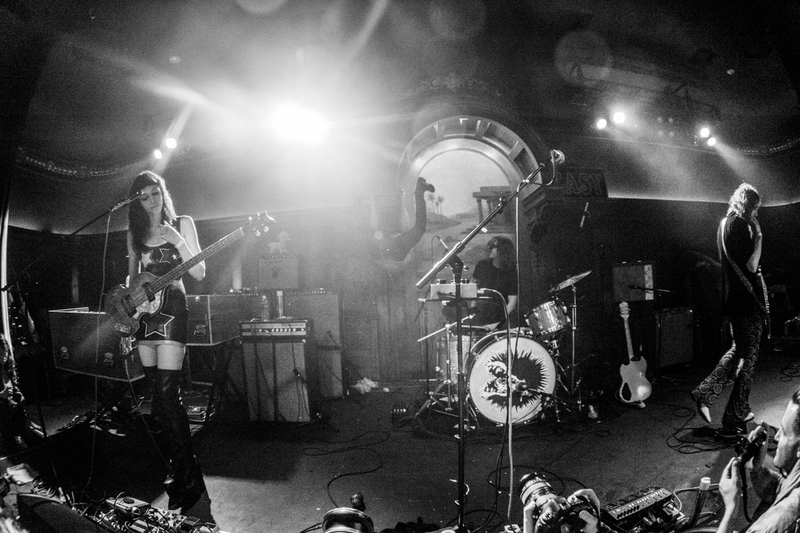 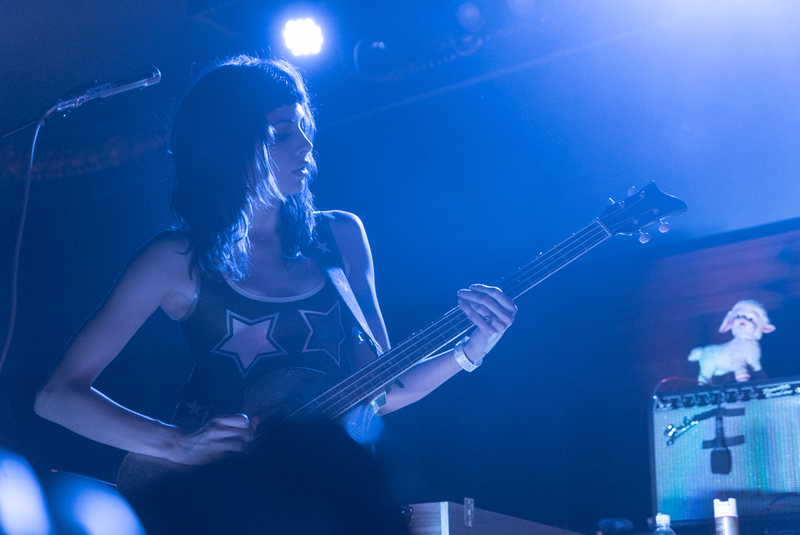 Lead guitarist David Strange slide around a double neck guitar and bassist Charlotte Kemp Muhl held everything together while being held together in skin-tight latex. 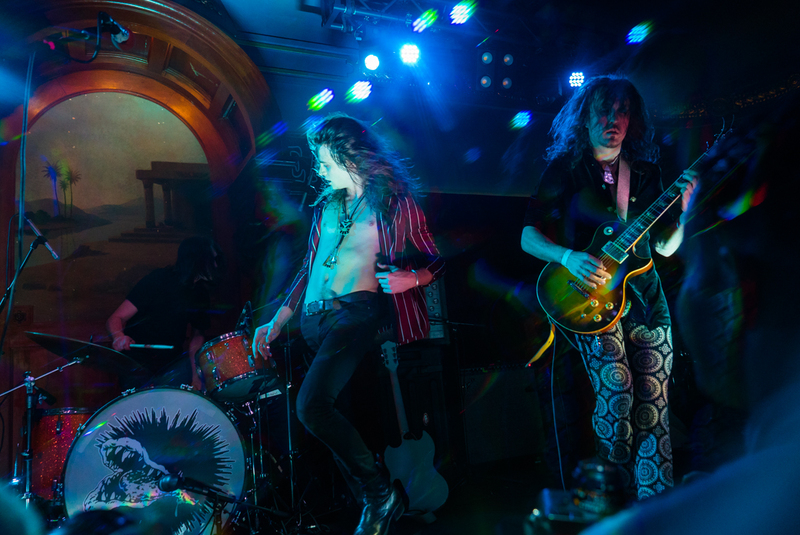 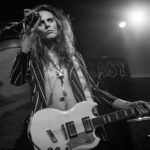 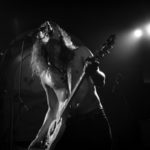 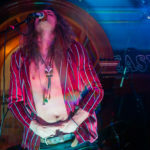 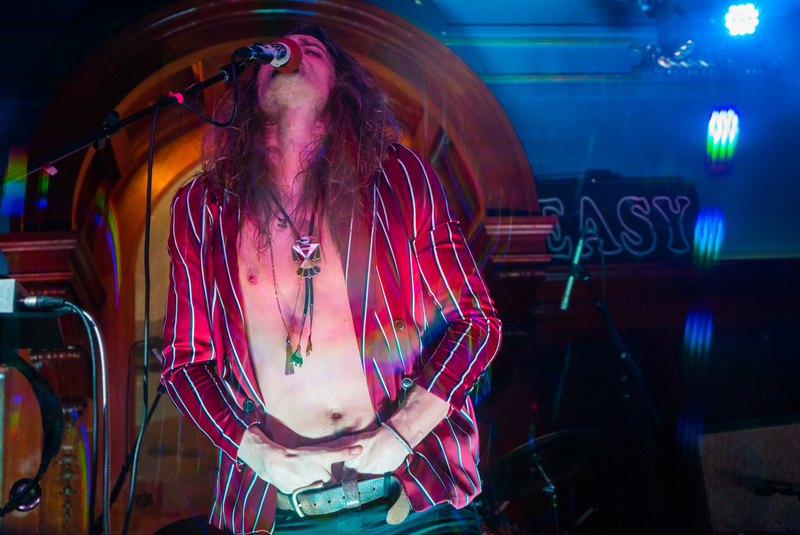 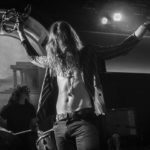 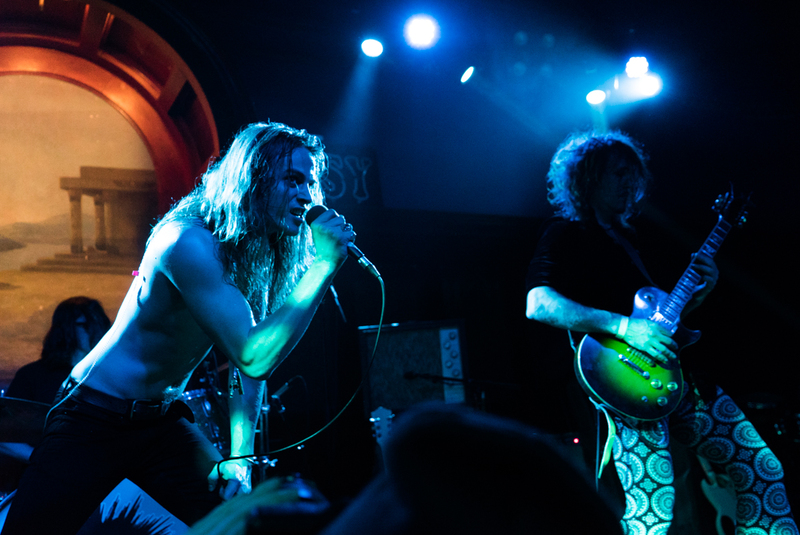 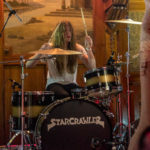 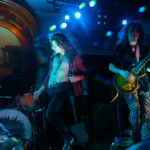 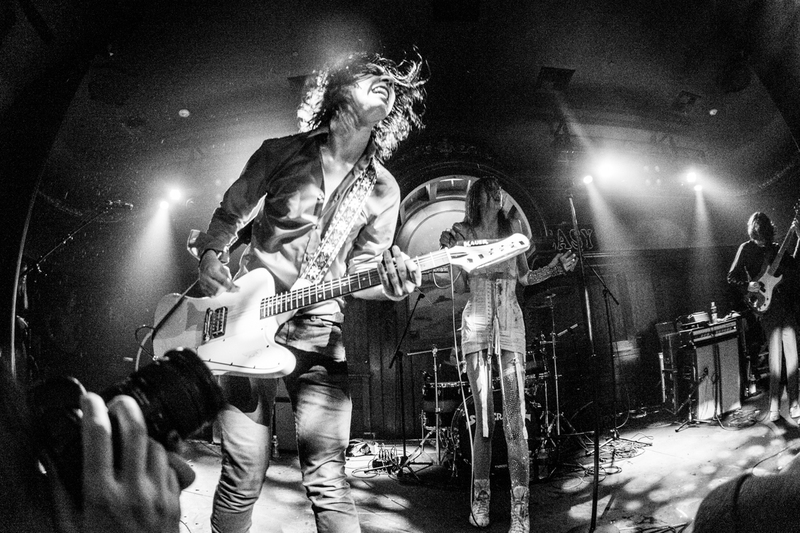 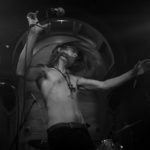 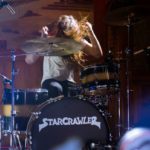 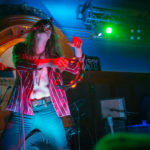 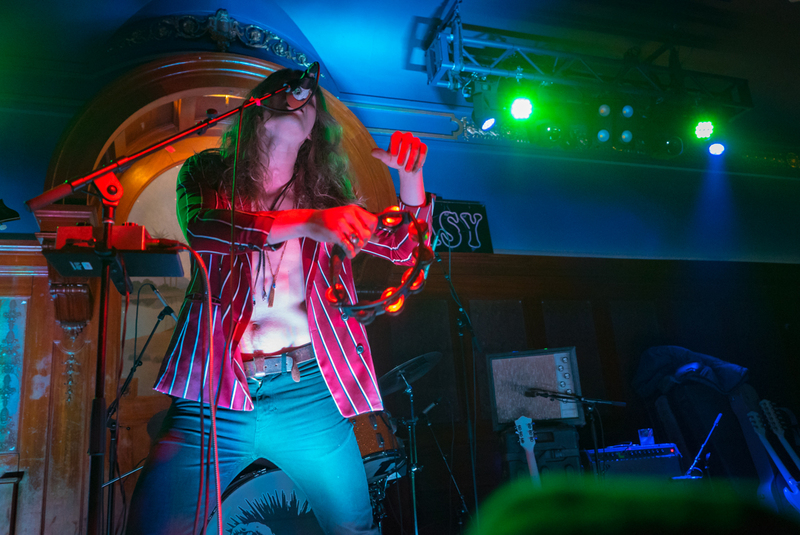 Although the band is oft described as 70s glam/psych rock, they also project a healthy dose of 80s hair band ala Skid Row mixed with a touch of Van Halen. 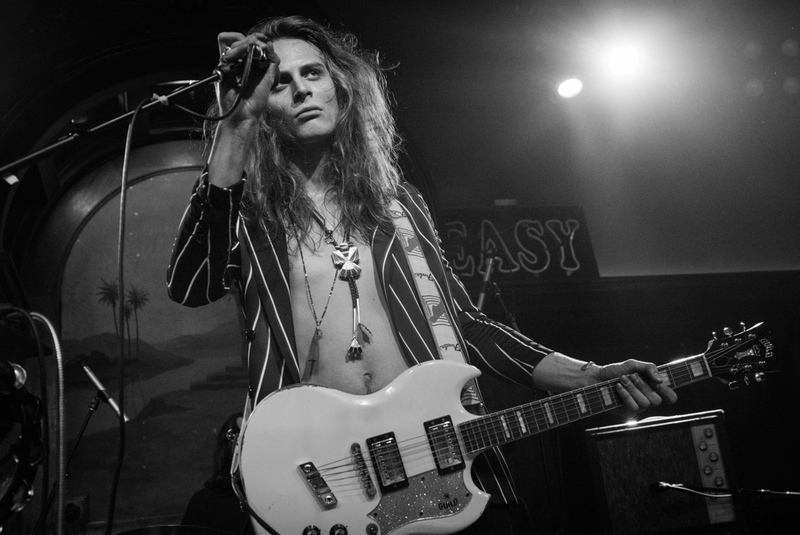 Opening the show was the band Easy. 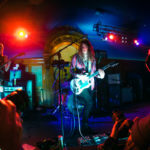 Heavy on the guitar rock spectrum, they were a lot of fun and a bit more tongue in check aware. 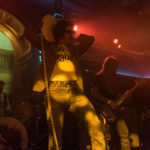 The band finished their set with a fantastic cover of the Stooges’ “I Wanna Be Your Dog”.